For more than 30 years, Republican and Democratic administrations in Illinois used Meritorious Good Time (MGT) without controversy to promote a safe prison system by awarding up to 180 days off inmates’ sentences for good behavior. This is a universally accepted correctional tool, and Illinois law excludes inmates serving time for violent crimes from receiving any MGT credits. Since MGT was suspended, Illinois has added 4,000 inmates to its total population, going from 45,000 to 49,000, a record high. While every prison struggles with its population, medium and minimum-security facilities, which mostly house low-level, non-violent offenders, face the most severe crowding, leaving IDOC’s staff and administration no choice but to pack inmates into unsuitable and often unsanitary places. These conditions frustrate rehabilitation efforts, exhaust limited resources, and create a dangerous environment for inmates to live and staff to work. Restoring MGT is good public policy and is supported by research as a sound management tool. We call on Governor Quinn to restore and reinstate MGT in Illinois immediately. 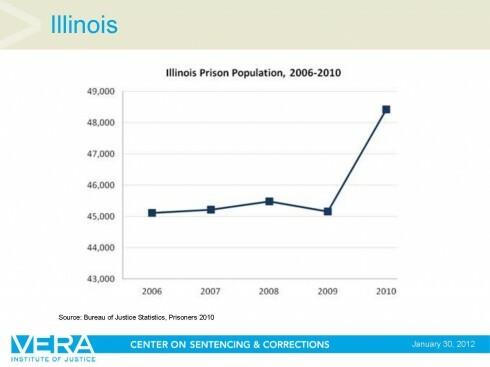 If you agree with this position, we urge you to TAKE ACTION by asking Governor Quinn restore MGT in order to help significantly reduce prison overcrowding in Illinois.